A continuation of the Wordless Wednesday. The blurry person is my Grand Uncle Clement! He’s the one that was born about 3 months before my dad. That means my grandmother and great grandmother were pregnant at the same time. And..the cute one in this picture is ME of course. 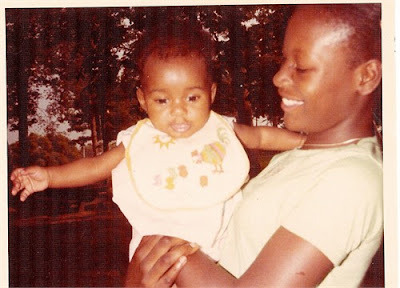 That’s my cousin Michelle holding me. Another interesting thing I found about Alfred Ferebee is he and Nancy Spence had one child (that I know of) name Charlott Ferebee. I wasn’t even looking for her death certificate when I found it. But, here it is, Charlielottie Ferbee. The interesting thing about the death certificate is the informant is W.M. Lowrey. This had to be my William Lowry! Not only was he the informant for Alfred Ferebee but for the daughter also?!?! The puzzling thing is Alfred married Nancy Spence. However, she’s listed by the informant as Nancy Griffin. I will have to order the marriage certificate to be certain about the names. I found a death certificate for a Nancy Frisbee (common misspelling of Ferebee) that died in 1924. Her father is listed as C W Griffin and mother is Sarah Bouges. Everything seems to match, however, I’m not sure about the name. Searching the marriage certificates for Nancy Griffin yielded a marriage for Nancy Griffin and Moses Spence. Perhaps, Moses died and Nancy remarried Alfred by 1902. I found a Nancy Spence listed in the 1900 census, living alone and a widow. She’s listed as having given birth to 8 children but only 2 were living. Living next door was Caleb Griffin and his wife Sarah. Possibly the same C W Griffin listed on her death certificate. In their home is their grandson Ernest Spence. Maybe Nancy’s son. By 1910, Nancy is married to Alfred and they have a 4 year old daughter named Charlott. The next blog will be ‘AS PASQUOTANK TURNS’. You’ll see how we’re related to almost everyone (black person) in that county thru marriage or blood!. I’ve had a hunch that this William and Ann Lowery on the 1880 census are related to me. I’ve said it before that I thought that William Barker listed in this census as a grandson is my 2nd great grandfather William Lowry. 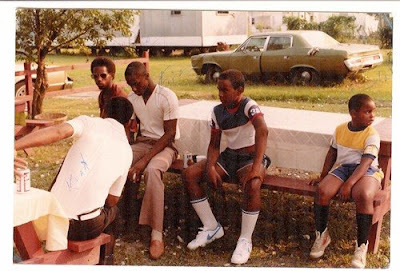 In addition, the 2 other grandsons, Issaac Boykin and Alfred Ferebee were half brothers to William Barker. I do know that William and Ann Lowery had a daughter named Martha Lowery. She later married James Howell. My thoughts were that she had 3 other children out of wedlock and left them with her parents when she married. 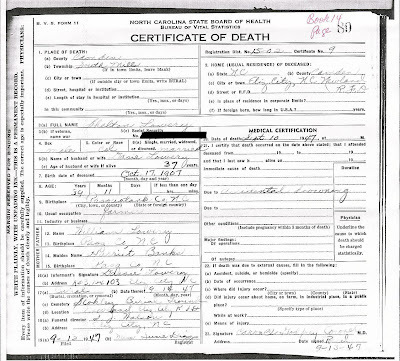 Thanks to Ancestry.com and their new upgrade of North Carolina Death Certificates, 1909-1975 that contains images of the actual death certificate, I’ve been able to connect some dots. I stumbled upon the death certificate for Alfred Ferebee. This is possibly the same Alfred Ferebee that was living with William and Ann Lowery in 1880. When I reviewed the death certificate, 3 things stood out to me as shocking. The mothers name is listed as Martha Laury. My next step is to find out if there is an article in the newspaper for 23 Dec 1923 that may list Alfred in it and what could have happened. Also, I’ll be ordering the marriage certificate for Alfred Ferebee and Nancy Spence from 1902. Hopefully, it will show who their parents are. What if Nancy Spence is also in my family?!?!?!?! I’m just so excited that I could have found a half brother for my ancestor. Also, confirmed my suspicions about Martha Lowry and her children prior to marriage. That’s how I met my cousin, Tina, in November 2007. See, her grandmother, Rosa Lowry, is my great grandmothers, Bessie Lowry, sister and her grandfather, Enoch Spence, is my great grandfathers, Aaron Edward Spence, brother. 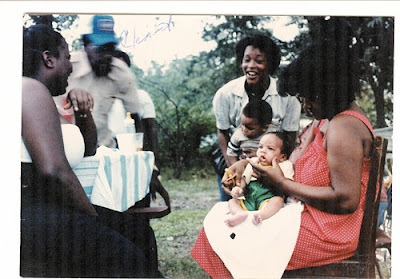 Our family story has always been 2 sisters’s married 2 brothers we’re all double related. I always heard the story but never really knew it. I didn’t know Rosa’s side of the family, although we have the same side. But, I never knew her children, grandchildren etc….til now. When Tina contacted me, I was skeptical. She found me thru Ancestry.com. I thought no one else was researching my family tree. I would look at message boards and websites and everyone was researching other counties in NC. The rare post I would find researching African-American ancestry in Pasquotank would be for a different surname. Her: Hey Cuz! Girl, tell me who you are (who’s your mom)… I didn’t know I had family in Florida! 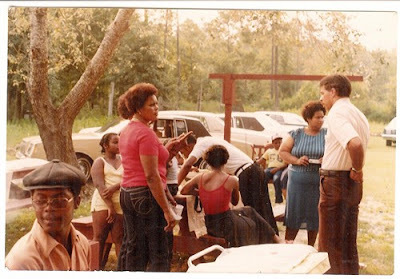 Did you go to the family reunion this year? I was there. My Mom is one of Rosa Spence’s daughters her name was Matlene (but she goes by Madeline) How do I see your family tree? Maybe you can help me, I’m looking for my father’s grandmother’s family and I’m hitting a brick wall — how do I get around that? Me: Hey. My dad is Spence. His mom is Spence. Her mom is Bessie Lowry. Her parents are William Lowry and Harriet Banks. Harriet’s parents are Caleb Banks and Henrietta. What’s your dads name and DOB? Also where was he born? Maybe I can find something. I missed the reunion. My grandma told me that the Spence family from South Mills came. I’m trying to compile a family tree for the next on. That’s how it all started. Now, we don’t do our research without each other. We’re always sharing ideas, theories and finds with each other. Well, this goes to show you that family stories are helpful, but not always accurate. My aunt said they didn’t find water in his lungs and he probably died of a heart attack. However, as you can see from the death certificate, they didn’t do an autopsy and it states he died of an accidental drowning. However, she did remember that they had 3 funerals in her church and John Adams was sent back home. According to his death certificate, he was sent back to Fayetteville for the funeral. The other 3 men were buried in Elizabeth City, NC at Stokely Burial Ground. The funerals were handled by Walson Funeral Home in Elizabeth City. The sad part, besides 4 men losing their loves, is my great uncle Johnny drove them to the river that day. Johnny is Shelton’s nephew. I wish Linton was still alive, I would love to talk to him about this and get his story. Genealogy is a genuine obsession of mine. My family nor friends quite understand it; however, they all think I should do it professionally. I don’t think I’m there yet. I love sharing my recent ‘finds’ with my family. More than likely, they have no clue whom I’m talking about and constantly get confused about which Aaron Edward Spence I’m referring too or who exactly was William Lowry, etc. But for me, explaining it is easy. I have these ancestors, my family, memorized. I can tell you who had a half sister, how the Ferebee surname got into our tree, what year my 3rd great grandfather passed away, etc. These are my family. One of the most interesting facts that I found is a relative shared the same birthday as I. He’s the son of Shelton Lowry (Brother to Bessie Lowry-my great grandmother). He was born 11 Mar 1928. Sure there is 50 years difference between our births, but I think it’s awesome that a relative and I share the same b-day and I don’t even know him. I intend on writing the library in Elizabeth City, NC (which covers several counties in northeastern NC) to see if they can pull an article about Shelton’s drowning. Another great aunt of mine told me that all in the boat died and even gave me the name of the person that rocked the boat. However, the problem that I have is, if everyone died, how did they get the story about rocking the boat and Shelton saying ‘Don’t rock the boat because I can’t swim’? Another tidbit she gave me was that Shelton may have died of a heart attack because he was so frightened about drowning. She said her sister told her that there was no water in his lungs. She didn’t know how true that was but I told her I’d order his death certificate and see what it says. 5 people were on the boat. John Adams rocked the boat. They begged him not to rock the boat. I found record for 4 people that died on 10 Sept 1947 in Camden County, NC. I will be ordering these death certificates. I would think that if so many people died in a drowning in a little city like South Mills, it may be in the papers.